Those who avoid pentatonic scales because they believe they are overused or too simple. Those who use pentatonic scales because they are easy to get into and haven’t learned other scales yet. Mind Blown. Well ok, not really.. but I agree with Paul. If you play Rock, Metal, Jazz, Blues or Country music, why in the world would you want to avoid such a useful and great sounding scale? It just works well everywhere! 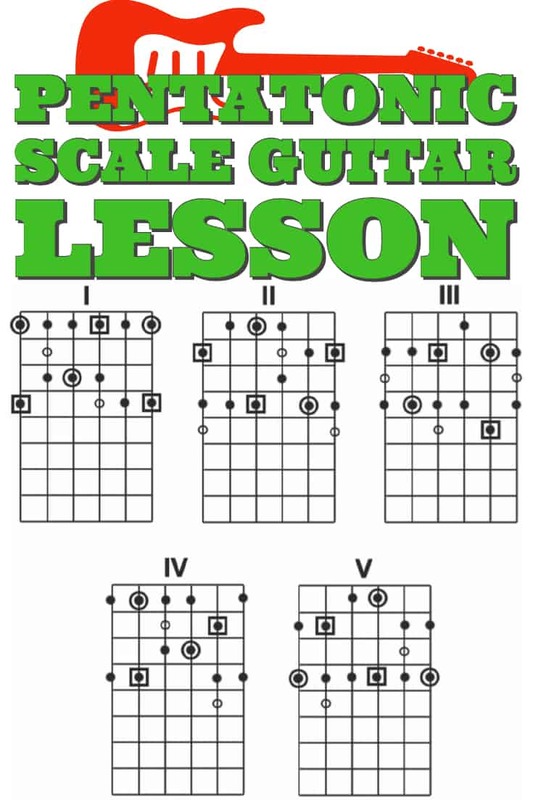 That’s not to say there are many other equally interesting scales and arpeggios you can add.. but the Pentatonic scale is the Swiss Army Knife of scales in our guitar toolbox. Most guitarists cannot, however, the ones who can are the ones who stand above the rest of the pack when it comes to soloing and improvising. 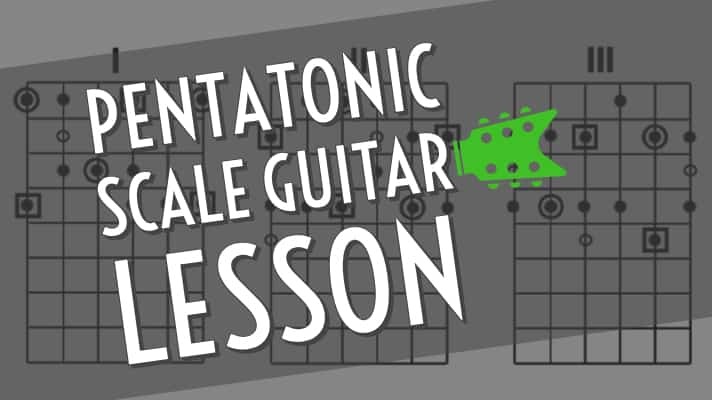 In this lesson, I’d like to examine the Pentatonic scale, its origins in classical theory and most importantly, how to get out of that first position and move around the neck with confidence and conviction in any key! 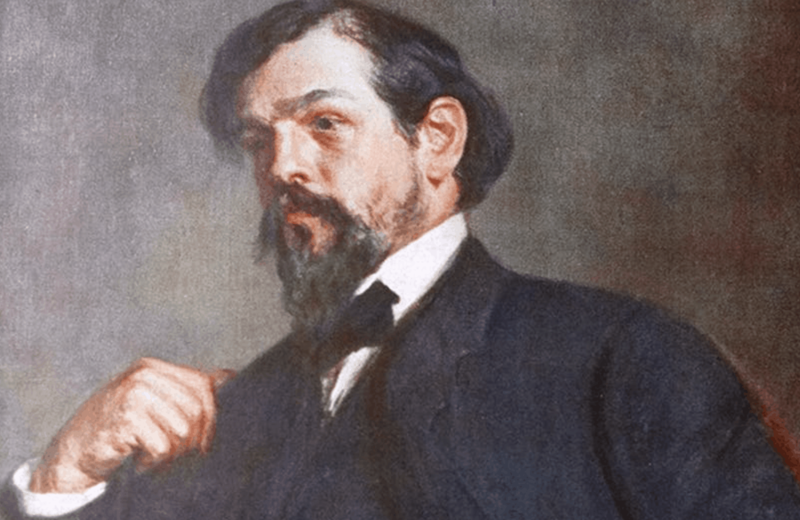 The Pentatonic scale’s usage in various forms dates back as far as ancient Greek music and has played an important role in Celtic, Hungarian Folk and even Classical period composers such as Claude Debussy. It wasn’t until the 20th Century that its modern form evolved into what became synonymous with the sounds of American musical styles from Ragtime, Jazz, Country, Blues, Rock and Roll and into modern Metal and hybrid styles of the latter three. For aspiring guitarists, in many cases, it is one of the first things we learn on the instrument and for some, the only scale from which to draw improvisations or lead guitar lines. As you may have guessed the Pentatonic scale is a five note scale originating from the Ancient Greek word “Pente” meaning literally –FIVE. The scale having only 5 notes is exactly what gives it its distinct sound. In order to use Pentatonics effectively in your playing, I believe it is important to understand how these scales are pulled directly from the Major scale. We will use the Major scale as our foundation and use simple formulas to map out our Pentatonic scale counterparts and shapes on the guitar neck. If you’re not familiar with how the major scale works, check out my previous lesson on guitar Scales where I explain in detail how to do just that. Otherwise, read on below. By eliminating a few notes we end up with the 1, 2, 3, 5 and 6. This is the modern formula recognized as a Major Pentatonic Scale. Try playing both scales slowly over a C Major chord*. Can you hear the difference just a few notes make? This is a common sound most associated with Country, Southern Rock and sometimes in Blues music. The Minor Pentatonic Scale is the go to scale for many a blues, rock and metal guitar player over the last 60 or so years. If you’re like me and many other professional guitarists… it’s just easier to mentally convert everything to minor and blanket the neck in what is perceived as the minor pentatonic scale shapes. Let’s first build our scale off of the Relative Minor or 6th degree of our Major Scale, in this case A minor. In relation the the Natural Minor Scale we end up with the 1, 3, 4, 5 and 7 scale degrees. That works fine… but I tend to lean toward the thinking of intervals as they relate toward their MAJOR scale counterparts. With this in mind, I prefer to think of it as a 1, b3, 4, 5 and b7 from the Key of A Major (A, B C#, D, E, F#, G#, A). This is completely subjective so use the formula that YOU are comfortable with. Whatever works for you. I realize some people prefer horizontal and others prefer vertical chord and scale charts.. so I’ve included both types. Hollow Dot: Converts minor to “blues” scale (see below). The best part about Major and Minor Pentatonic shapes is that we don’t have to learn different shapes for both scales. We simply shift our focus from the Major or Minor root depending on the sound were going for or the chord changes underneath. If I’m trying to get the pentatonic minor sound I’m really going to try to land on and end my phrases on A notes or even the chord tones in the A minor chord (A C E). By approaching your pentatonic scale improvisations in this way, you’ll build more melodic and interesting solos while also learning where the “good notes” are on the neck. Memorize those 5 shapes and practice starting from the root notes, meaning, start and end on the root regardless of which string you’re on. My students have had the best results this way because they are forced to think about where the Major or Minor roots are located within each shape. Use alternate picking and when you’re ready, a metronome. Noticed how I started on the 2nd fret, D String, E note, went through the entire scale ascending and descending, then came back to and ended on the E root note. That’s how you should practice all 5 pentatonic scale shapes. 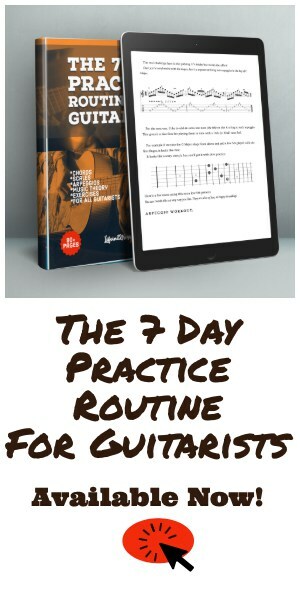 Last weekend I ran a weekend long free guitar coaching for all of my email subscribers. It was so fun and I learned so much about what everyone is struggling with on the guitar. So Jake’s problem is a really common one and I’m happy to tell you, it’s also a really easy one to solve. Sure, the “money” tends to be in the first and 2nd shapes. These are where all of your classic blues and rock licks seem to fall right? When we expand our pentatonic shapes across the entire fretboard we’re really setting ourselves free in terms of improvisation. 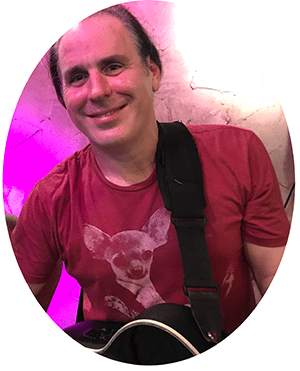 Having the entire neck available in any key or scale is liberating and a giant leap forward for taking your solos and improvisations to new heights. When learning all 5 pentatonic shapes, try soloing only on 2 strings for a while. In this case I played some very simple lines using only the B and high E strings. Nothing fancy.. just the notes on only 2 strings. Incorporate some bending into your shapes. The key with bending is to keep it in the scale. Make sure you bend up to the next diatonic note. Play through all 5 shapes in time, or to the rhythm of the beat or track you’re playing with. Experiment! Try other minor scales such as Harmonic minor, Melodic minor and other minor pentatonic scales in the parent key. Did you know you can play 2 other minor pentatonic scales in each key? Sure, the 6th (relative minor) is arguably the best sounding for Rock and Blues.. but there are 2 others as well! The sound can be awkward at first for sure. Playing off of the 2nd and 3rd will reveal a bit of a jazzy, fusion kind of sound. The key point though is that you’re still perfectly in key and can add this to your improvisation toolbox. The best part is… you don’t have to learn any more shapes. Just move them to the other minor roots in the parent key! Now lets take a look at the minor Pentatonic scale’s most popular alteration, the Blues Scale. 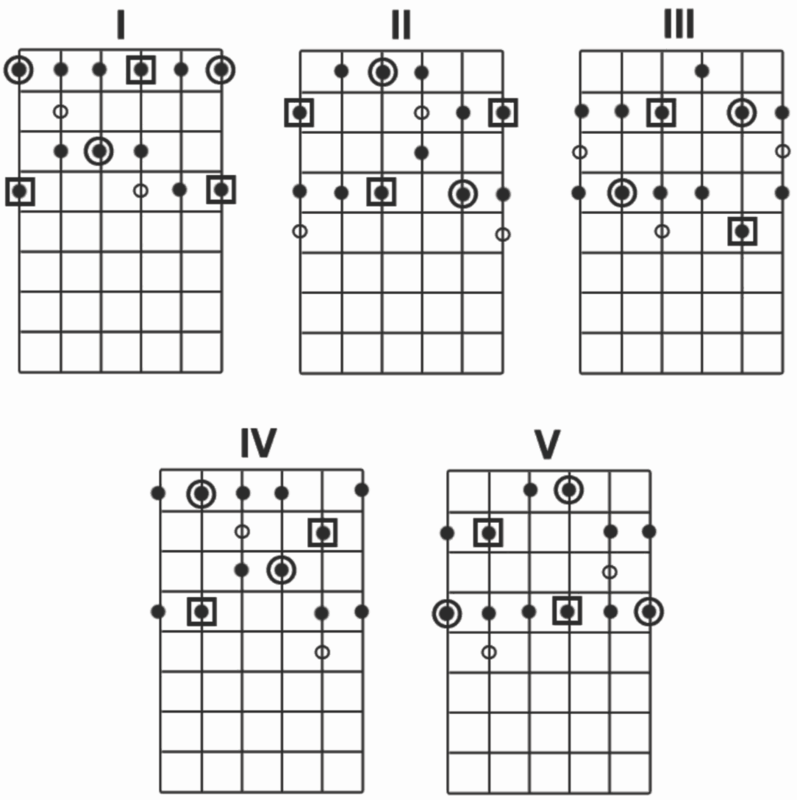 The Blues Scale is simply a minor Pentatonic scale with a ♭5th (or ♯4th) scale degree added. By definition it would be classified as a hexatonic or six-note scale. For practical usage, it is widely employed as a minor Pentatonic with the passing tone ♭5th (or ♯4th) added for effect at the discretion of the player. When I say “effect”.. I mean it makes everything sound more bluesy. Since any usage of the Blues Scale theoretically takes us out of key, its usage becomes somewhat more limited than an unaltered Minor Pentatonic. While we can play Minor Pentatonic scales off of the 2nd, 3rd or 6th of our Major Key Center, the Blues Scale typically sounds best when used only on the Relative Minor or 6th degree. While the exact origins of the Blues scale are up for debate, its usage as we know it can be traced to roughly to the early part of the 20th century. 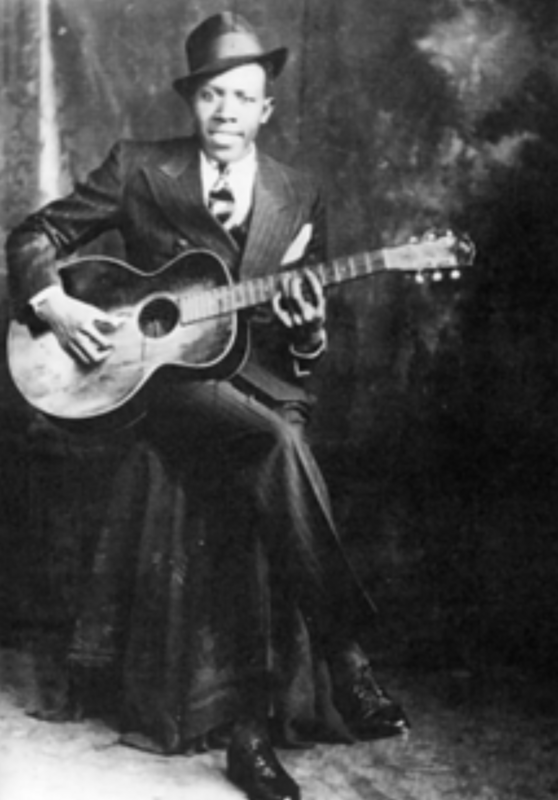 As thinking guitarists, it’s hard to dispute the influence of Blues pioneer Robert Johnson (1911-1938) who employed this minor “Blues” Pentatonic idea throughout his compositions in the 1930′s. Jazz aficionados are quick to cite Charlie Parker’s (1920-1955) improvisational usage and wide advocation of the ♭5th, along with other less used (at the time) harmonic devices such as 9ths, 11ths and 13ths as a major influence in the early 1940′s, subsequently resulting in the “Bebop” sub-genre of Jazz. Even before these guys… you can hear the beginnings of blues scale sounds in Ragtime music and particularly turn of the century era piano music from famed pianist and composer Scott Joplin (1868-1917) – “The Entertainer”, “Maple Leaf Rag”. Regardless of your music listening preferences, you can rest assured that the influence of the Blues scale has made an impact on some of your favorite guitarists regardless of style or era. We could go on and on branching these historic and important guitar players into an overlapping weave of modern guitar playing influence. For example one of my favorite guitarists, Greg Howe, was heavily influenced by both rock legend Eddie Van Halen AND Jazz/Fusion pioneer Scott Henderson, although his recent work resembles neither. Eric Johnson’s unique style was undeniably shaped by blues great Stevie Ray Vaughn, Jazz/Fusion guitarist John McLaughlin as well as Country giants like Chet Atkins. 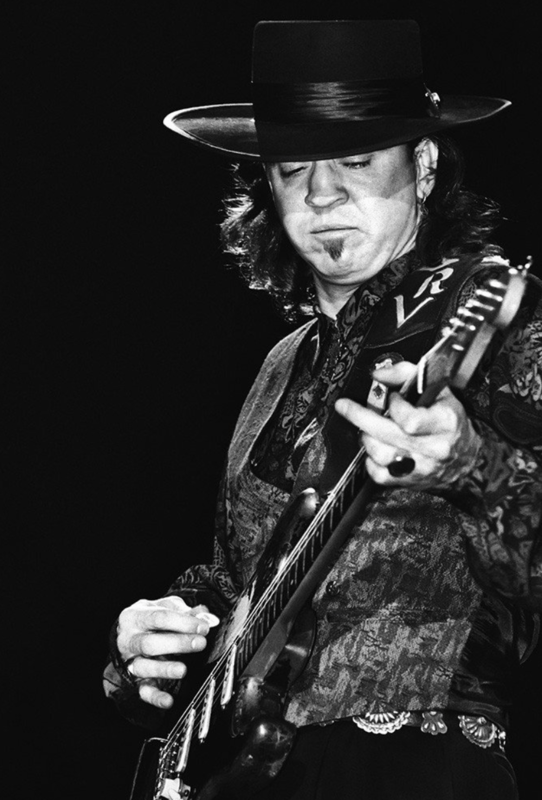 When I hear modern guitarist Joe Bonomassa, I can’t help but compare him to the previous ground-breaking guitarists. He wears his influences on his sleeve. Modern Metal guitar legends Zakk Wylde and Pantera guitarist, Darrell “Dimebag” Abbot’s guitar playing is about as far removed from Robert Johnson’s acoustic blues as it gets, yet their use of the blues scale and ♭5th in solos and riffs is indisputable evidence of such influence. Understanding our influences and examining their influences can be a rewarding trip down the road to understanding music and becoming a better guitar player.